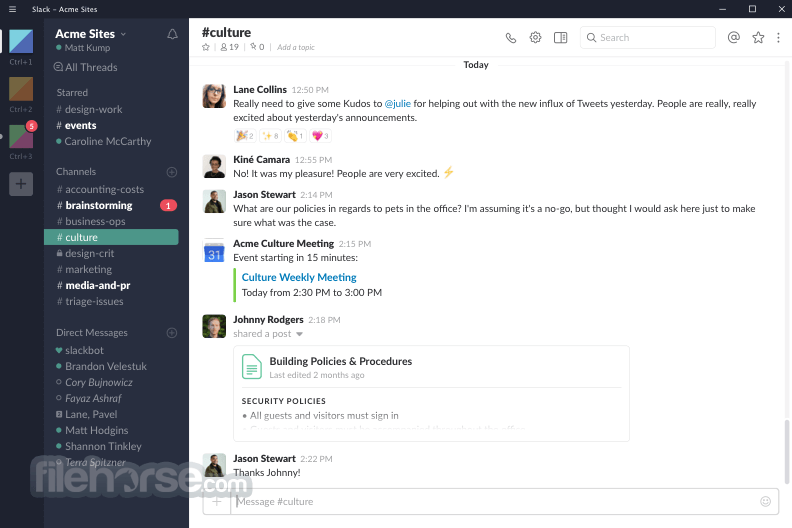 Slack for Windows brings all your communication together in one place. It's real-time messaging, archiving and search for modern teams. Not just your messages, but all your files, images, PDFs, documents, and spreadsheets can be dropped right into Slack and shared with anyone you want. Add comments, star for later reference, and it’s all completely searchable. If you use any services like Google Drive, Dropbox, or Box, just paste the link and that document is immediately in sync and searchable too. Download Slack Offline Installer Setup for PC! Everything in Slack—messages, notifications, files, and all—is automatically indexed and archived so that you can have it at your fingertips whenever you want. Slack for Windows also indexes the content of every file so you can search within PDFs, Word documents, Google docs, and more. With one search box and a set of powerful search operators, you can slice and dice your way to that one message in your communication haystack. To reach a colleague directly, send them a Direct Message. It's completely private and secure. Download Slack Offline Installer Setup for PC!